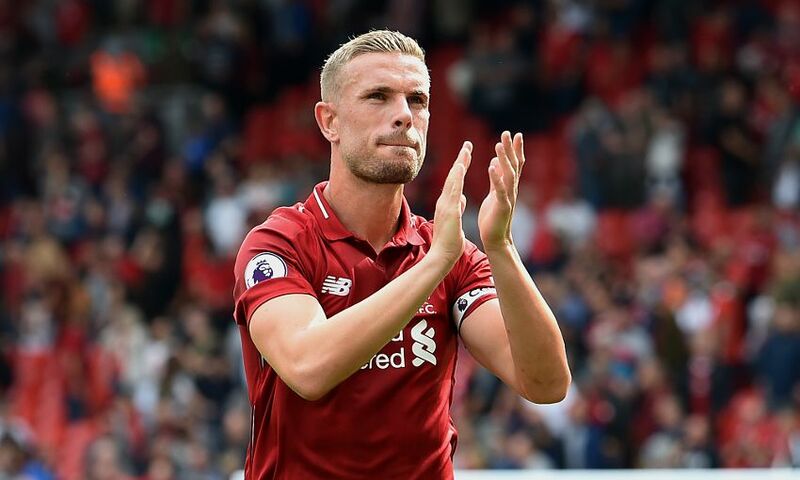 Jordan Henderson knows there’ll be no quarter given when Liverpool and Everton meet on the field this afternoon, but has highlighted the powerful impact the clubs can make to the local community when they unite off it. The captain, who is suspended for today’s Anfield clash, used his column in the official matchday programme to specifically highlight the work of the Fans Supporting Foodbanks initiative, which was founded jointly by both Reds and Blues. He wrote: “In the days leading up to today’s game there has been a big push to support the foodbanks, a cause which is always worthy and none more so than at this time of year when the struggle to make ends meet becomes even more challenging for families throughout the country. “On Merseyside we are both fortunate and unfortunate in this respect. We are unfortunate because the need for this kind of initiative is greater here than it is in other parts, but we are fortunate because the people of this city have no peers when it comes to standing together and sticking up for one another. “It doesn’t matter whether you are a Red or a Blue, there is something about Liverpool as a city which creates this kind of solidarity. I am not from this area so I can’t claim to be any kind of expert about why this is the case, but in the time that I have been at Liverpool I have seen and heard of enough examples to make me appreciate why this is such a special place. “The fact that Fans Supporting Foodbanks was founded on Merseyside by supporters of Everton and Liverpool is not a coincidence. I know people long for the return of what was known as the 'friendly derby', but the kind of friendliness that underpinned that era can still be found outside Goodison Park and Anfield on matchdays when the lads from the foodbanks collect on behalf of those in need. “I am reliably informed that two of the leaders of this campaign are Ian Byrne and Dave Kelly. Today, one will be found on the Kop cheering on Liverpool and the other will be in the away end supporting Everton - if they’ve been able to get hold of tickets anyway! “I know this isn’t new to Merseyside and there have been countless examples of fans putting allegiances one side to fight for a common cause, none more so than after the Hillsborough tragedy. But it is still worth highlighting at every opportunity because, as I said, it doesn’t happen everywhere. I’ve also been told that these efforts are increasingly crucial when it comes to combating food poverty on Merseyside with as much as 25 per cent of foodbank donations coming from Liverpool and Everton fans on matchdays. “I shudder to think what would happen if people were not so generous, particularly with so many families in this area experiencing hardship through no fault of their own. That is what makes it so heartening that everyone in Merseyside football – players, clubs, supporters – come together to try to make a difference. “From the point of view of those of us in the dressing room we are always fortunate to be able to count on your support and it is only right that we return that support whenever possible by giving whatever backing we can for Fans Supporting Foodbanks. I have no doubt the players at Everton feel exactly the same way.